The study involved four major activities to estimate the current market size of G.fast chipset market. Exhaustive secondary research was done to collect information on market, peer market and parent market. The next step was to validate these findings, assumptions, and sizing with industry experts across value chain through primary research. Both top-down and bottom-up approaches were employed to estimate the complete market size. Thereafter market breakdown and data triangulation was used to estimate the market size of segments and subsegments. Extensive primary research has been conducted after acquiring knowledge about the G.fast chipset market scenario through secondary research. Several primary interviews have been conducted with experts from both demand and supply sides across four major regions, namely, the Americas, Europe, Asia- Pacific, and rest of the world (the Middle East & Africa). This primary data has been collected through questionnaires, emails, and telephonic interviews. Top-down and bottom-up approaches have been used to estimate and validate the size of the global G.fast chipset market and various dependent submarkets. 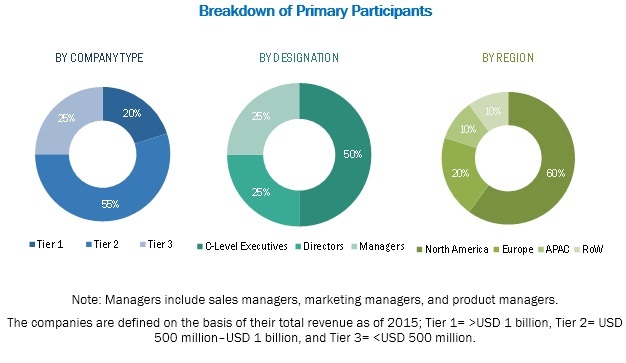 Key players in the market have been identified through the secondary research and their market share in the respective regions has been determined through primary and secondary research. This entire procedure includes the study of annual and financial reports of top players and extensive interviews of industry leaders, such as CEOs, VPs, directors, and marketing executives. The key players in the markets have been identified through extensive secondary research. After arriving at the overall G.fast chipset market size from the market size estimation process explained above, the total market has been split into several segments and subsegments. To complete the overall market engineering process and arrive at the exact statistics for all segments and subsegments, the market breakdown and data triangulation procedures have been employed, wherever applicable. The data has been triangulated by studying various factors and trends from both demand and supply sides. In addition to this, the market size has been validated using both top-down and bottom-up approaches. The overall G.fast chipset market is projected to reach USD 4,216.3 million by 2022 from USD 41.0 million in 2016, growing at a CAGR of 116.5% during 2016-2022. Major drivers for market growth are increasing impact of national broadband plan (NBP), increased competition among broadband service providers, and growing demand for ultrafast broadband services. In Tier 1 cities of developed countries, a large proportion of multi-story residential apartments are predominant driver for CPE-based deployment in the G.fast chipset market. Moreover, the high-speed variation of G.fast-based broadband over longer copper-line length makes it less suitable for long-distance DPU-based deployment in many parts of the world. The CPE-based deployment is more cost-effective compared to DPU-based deployment. The MDU-based CPEs deployment offers comparatively lesser equipment and maintenance cost over its counterparts. The expected increase in the port density of G.fast chipset is expected to drive the G.fast deployment over longer cooper loops. Moreover the expected utilization of existing DSL street cabinets in Europe by the broadband service providers is expected to offer significant growth opportunity in deployment of G.fast technology over longer copper-line length, in the coming years. The growth of the residential segment is largely attributed to the growing penetration of 4K TVs among middle-class residential customers in technologically advanced countries. Moreover, residential customers also use a diverse mix of interconnected devices such as laptops, smartphones, tablets, gaming consoles, Internet video consoles, and machine-to-machine (M2M) devices. In contrast, subscription video services remain tethered to slow-to-change set-top boxes linked to TV sets. Synergistic effects between these service offerings are spawning increased network usage and customers’ demand for high bandwidth from the fixed broadband service providers. The presence of G.fast device manufacturers in this region contributes significantly to the G.fast chipset market. 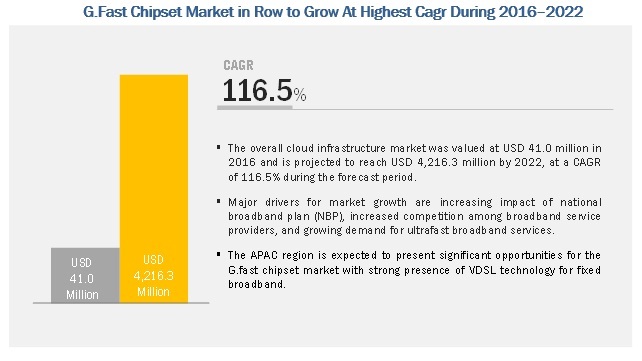 Factors such as increased competition among service providers, supportive government policies to meet national broadband plans, and faster speed of G.fast technology over shorter copper length are helping the G.fast chipset industry to grow rapidly in North America and Europe. Moreover, the extensive presence of MDUs in North America offers significant opportunity for the G.fast chipset market. The telecom companies in North America are expected to replace FTTH deployment by FTTdp for the last few meters, which can be replaced by copper without compromising the data rates. Key players in the G.fast chipset market include Qualcomm, Inc. (US), Broadcom Ltd. (US), Marvell Technology Group Ltd. (Bermuda), MediaTek, Inc. (Taiwan), Sckipio Technologies SI Ltd. (Israel), Metanoia Communications, Inc. (Taiwan), Chunghwa Telecom Co., Ltd. (Taiwan), CenturyLink, Inc. (US), BT Group plc (UK), and Swisscom AG (Switzerland). Qualcomm, Inc. in May 2016, announced that its subsidiary, Qualcomm Technologies, Inc. launched a new GigaDSL chip which includes the QCO5700 for multi-dwelling unit (MDU) networks and the QCM5720 for customer premises equipment (CPE). The new chips are expected to offer 1 gigabit per second (Gbps) broadband over existing telephone lines. In October 2015, Broadcom Ltd. announced VDSL2 35b and G.fast bonding support for two new protocols under the International Telecommunication Union (ITU) guidelines. The new product is intended to strengthen the company’s G.fast portfolio. In August 2015, Cambridge Industries Group (CIG), an Israel-based broadband service provider, announced to enter the G.fast chipset market with Sckipio-based G.fast CPE. Where will all these developments take the various regions in the mid to long term? How high cost of on-premises fiber deployment is acting as boon for G.fast market growth rate? What are the competitive advantage for G.fast over VDSL2 and DOCSIS 3.1 technology? 12.4 Marvell Technology Group Ltd.
12.6 Sckipio Technologies Si Ltd.
12.8 Chunghwa Telecom Co., Ltd.